The new Marvel Legends Ares Build-A-Figure wave is now on shelves. This wave is exclusive to Walmart, and the figures are priced at just under $11 each. Collect all 8 figures to form Ares, who is adorned with his giant sword and Spartan-style helmet. 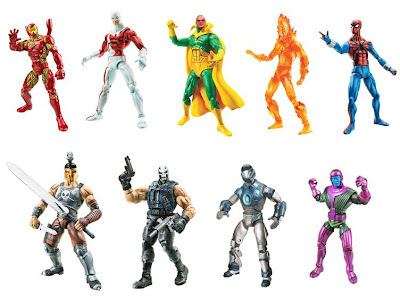 There is also a variant of the Human Torch who is packed one figure per case of 12. Click on the thumbnails below to see them in-package (courtesy of MarkG).